Jacob's Crackers: The Tart is in the Pie ". Mixed Berry, Cherry & Almond Clafoutis "
The Tart is in the Pie ". 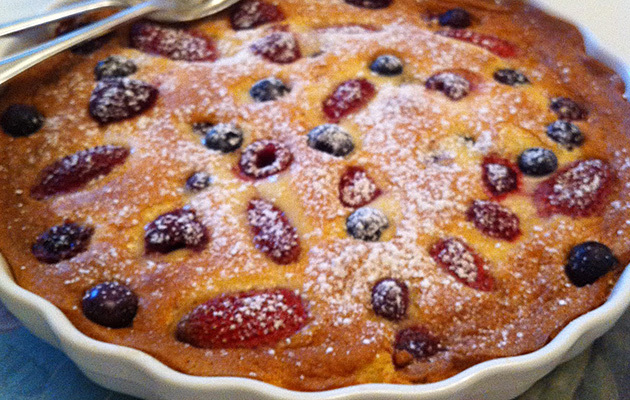 Mixed Berry, Cherry & Almond Clafoutis "
CLAFOUTIS is a Classic French batter pudding from the Limoges region of France . A crisp and light batter, studded with Colourful & refreshing fruits . It is best served warm to bring out the flavours of the fruits fully. Cherries are traditional but most fruits can be used , such as Apples , Apricots , Pears, Prunes, Plums, Rhubarb or Mixed Berries. Preheat oven to 190 c. Grease a shallow ovenproof flan dish ,scatter the cherries and mixed berries evenly over the base . Using an electric Mixer. whisk the egg , yolks and sugar until pale. Pour in the cream, ground almonds, flour, orange zest . Whisk until smooth . Slice the vanilla pod lengthwise and scrape the seeds. Add to the batter and mix well. Pour the batter over the fruits and bake in the oven for 25-30 mins, until it has risen and golden brown. Dredge the top with the icing sugar . Allow to cool slightly before serving it warm . Creamy custard, tangy fruit coulis are good complements to the Clafoutis . Ice cream provides a superb hot - cold contrast .